Nevertheless, for many truth seekers, it’s really not a matter of “if” ETs exist, but rather, why won’t they show us their lizard-like faces already? Well, now it seems, scientists may have finally worked out what aliens actually look like — should we ever come face to face with them. Thanks to the imagination of Hollywood, many people believe that aliens are monster-like creatures, very different to humans. But now a new study published in the International Journal of Astrobiology paints a more familiar face on alien life. For the first time, scientists from the University of Oxford show how evolutionary theory can be used to support alien predictions and better understand their behavior. Sam Levin, a researcher in the university’s Department of Zoology, said on Oxford’s website: “There are potentially hundreds of thousands of habitable planets in our galaxy alone. We can’t say whether or not we’re alone on Earth, but we have taken a small step forward in answering, if we’re not alone, what our neighbors are like,” said researchers. It seems that extraterrestrials are likely shaped by the same evolutionary processes that have shaped us humans, such as natural selection. So, just like us, aliens have probably, evolved to be fitter and stronger over time. Researchers based their conclusions on what major evolutionary shifts might have occurred on other planets and beyond. So, the theory suggests that our extra-terrestrial neighbors could be a lot more like us than we even realize. But even more interesting, the study specifically makes predictions about the biological makeup of alien beings and goes on to tell us what they might actually look like. Scientists predict that since aliens, like humans, have undergone major transitions as a species, they’ve likely evolved to look like us. If aliens have evolved like us, and science now tells us they may look like us, does that mean that they might also be walking among us? The Mutual UFO Network also known as Mufon, is dedicated to finding the truth about UFOs through investigation, research and education. They claim UFOs and extraterrestrial visitors are real. But we’re not being told because the information would have an adverse effect on our economy, world religions or result in public panic. But the truth is, sightings or encounters with alien-beings have been reported for centuries. The idea of humanoids who do not reside on Earth, yet have very similar physical attributes and possibly superior technologies, is not a new theory. 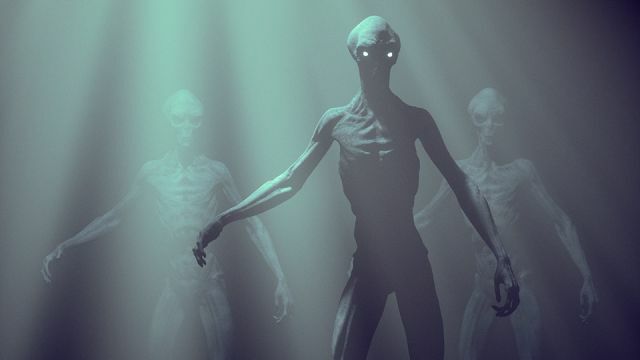 In fact, to date, Mufon suggests there have been nine different types of aliens reported including: Flatwoods Monster, Greys, Hopkinsville Goblins, Little Green Men, Nordic aliens, Reptilians, Sirians and Anunnaki. However, most talked about encounters surround “Greys,” which although somewhat humanoid, don’t really look that much like humans. Could it be that encounters go unreported because we don’t realize we’ve come face-to-face with an alien? Take for instance “Nordic” aliens, who are perhaps the most human in appearance of all extraterrestrials, and closely resemble people of Scandinavian descent. They’re thought to have blonde to reddish hair, blue or green eyes, and stand anywhere from five to seven feet tall. Some even claim that Nordics lack irises, which forces them to wear contact lenses to blend in when visiting our planet. But fear not, because unlike “Greys” the malevolent grey-skinned and glassy-eyed aliens, you’ll most often see in Hollywood movies — or standing over your bed at night — Nordic aliens are benevolent. They’re reported to be kind-hearted, spiritually advanced creatures and their mission here on Earth is largely that of goodwill. What has NASA said about aliens? NASA, as always, remains tight-lipped about UFOs and alien encounters. However, this past June, NASA was forced to deny claims from hacking group Anonymous that an alien announcement was imminent. Meanwhile, the Kepler space telescope has been hunting for planets since it was launched into orbit around the Sun in 2009. This remarkable telescope can spot tiny drops in a distant star’s brightness when a planet crosses in front of it, called a transit. To date, 2,335 planets beyond our solar system have been verified after being found by Kepler. Of these, only 30 planets, so far, have been found to be Earth-like and potentially able to host life. What does that mean for earth? Well, this means there could be 30 potential alien species visiting earth! The National UFO Reporting Center (NUFORC) is “dedicated to the collection and dissemination of objective UFO data,” and keeps careful logs of all UFO and alien sightings worldwide. Since 1905, there has been a total of 104,947 sightings. And with over 100,000 sightings around our planet, is it really that far-fetched to assume that certain alien species, who walk among us, do so because they’re hiding in plain sight? What do you think? Next articleCan You Really Get Herpes From Trying On Lipstick? Hey Buddy!, I found this information for you: "Scientists Say THIS Is What Aliens Might Look Like". Here is the website link: https://www.thealternativedaily.com/aliens-may-look-just-like-us-say-scientists/. Thank you.